Royal Restrooms offers a wide variety of portable restroom trailers from which to choose. Depending on your event type and location, a combination of our portable restroom trailers may be available to accommodate your outdoor facility needs. Our portable restroom trailers were designed with space in mind. For smaller events or parties at home, the restroom trailers can fit in the most challenging of spaces, and the units are elegant enough so that they can be discreetly placed on site. Large events often require more than one restroom area to avoid long lines and crowds and provide guests with easy access to the facilities. Royal Restrooms offers a variety of stylish portable restroom trailers to best suit the event type and restroom needs. 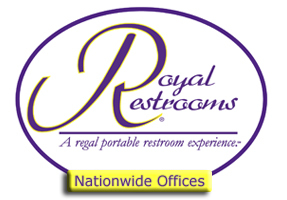 Royal Restrooms nationwide offices can mobilize to accommodate any size event in the contiguous 48 United States and many areas of Canada and Mexico. In emergency response situations and disaster relief efforts, Royal Restrooms guarantees delivery of units within 24-48 hours of completed rental agreement. Each restroom trailer pulls no more than 20 amps and operates off of (1) 110-volt outlet (standard household outlet). Two for the Ten-Stall Unit, or if the trailer has hot water. If power is not available onsite, a generator may be provided for an additional cost. Water may be supplied by a regular water spigot and garden hose. If water is not available on site, onboard fresh water holding tanks will supply a limited amount of fresh water for an additional cost.